George Washington, working as a young surveyor 254 years ago, drained a swamp. Now government workers are trying to make it wet again.Washington and his fellow investors had slaves dig a ditch to drain the Great Dismal Swamp on the Virginia-North Carolina border. 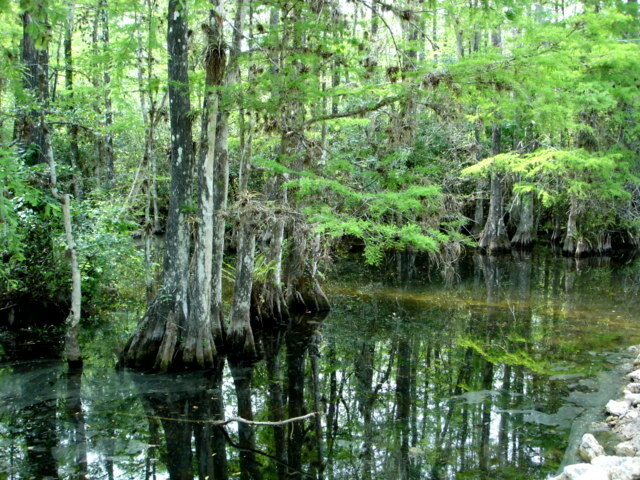 The rot-proof cypress and cedar were logged for ship masts, roof shingles and fence posts until 1974, when the swamp became a national wildlife refuge. But the logging dried out the soil and peat, making the area more vulnerable to carbon-intensive wildfires. The last two big fires at the Great Dismal released about 6.2 million metric tons of carbon dioxide — more than the annual emissions from a million cars. The Fish and Wildlife Service is trying to undo the damage by gradually raising the swamp’s water table. It’s doing that by capturing and rechanneling rainfall in the 150-mile network of ditches running through the 113,000-acre swamp. But conservationists are still trying to figure out the best way to return the Great Dismal to its natural state. This entry was posted in Biodiversity, Conservation Banking, ecosystem services, Water, Wetland Banking and tagged wetlands. Bookmark the permalink. Post a comment or leave a trackback: Trackback URL.